Blog » How to Fix Horizontal Banding issue in Print from Epson Printer? Many times we print our documents from the printer and find that the print quality is not up to the mark. Finding lines on the printed files can be very heartbreaking. These lines on the printed pages are due to banding. So, what is banding? Banding is consistent horizontal straight lines on the prints in the print head direction. The density of the banding depends entirely on its cause. Banding can be of two types; horizontal and vertical. While horizontal banding is common and occurs on the prints in the direction of the print head. Vertical bending is not frequent and runs opposite to the direction of the print head, can be broader or softer and generally not straight like horizontal banding. We hate to see lines like these on papers. Identifying the cause and solution of banding can be difficult. If your Epson printer has a banding issue, you might be looking for solutions to this problem. 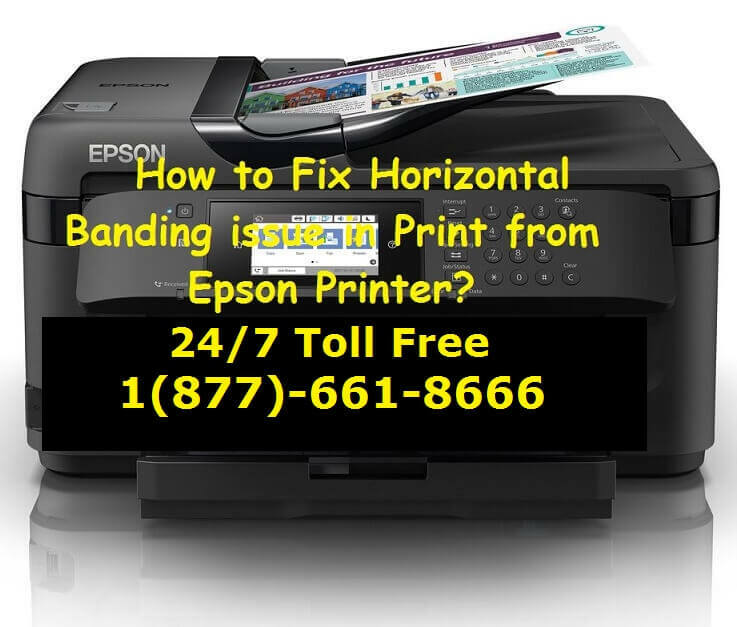 This article aims to help you in resolving this issue to Fix Horizontal Banding issue in Print from Epson Printer?. Each of the above cause requires to be handled differently. You can fix your printer with little efforts by yourself. These issues with your printer are explained with the required solution. The misaligned print head is a common reason for horizontal banding. Printhead alignment needs to be done while setting up the printer. Horizontal banding occurs if your print head is not aligned or you moved the printer physically from one place to another. Sometimes, it also happens that people do head alignment from the software avoiding aligning from the front of the printer. This leads to dark or off-color lines going through the print. It can also be like you are not aware that how to perform head alignment settings. You can refer to Epson manual to know how to do the print head alignment. Hopefully, you will not experience the issue again. But in case, if you still face this issue after alignment, you need to un-check the high-speed button in Epson driver or software. You can choose a super option or select 8 pass in your software. It is generally advised to run a print head alignment every six months. Another commonly occurring reason for horizontal banding is Nozzle clogs. This is common in inkjet printers. You will get lighter and off-colour horizontal banding in your prints. Depending on the colour and severity of clogging, the lines may not be throughout the print but to some parts of it. You may avoid such lines at an earlier stage, but this can cause a serious problem if not fixed on time. The dusty environment is one of the major causes of this problem. Sometimes, not using the printer for a longer period may also result in nozzle clogging. Another cause of this clogging is a malfunctioning print head. Now that you are clear that the reason for banding in the printer is Nozzle clogging, you now need to run a nozzle check. You can do this task directly from the menu system of your printer. You can also find this option in the utility features of the driver software. Once, you select the option of Nozzle check; a test pattern will be printed. The printer will print a stair step pattern lines of each colour. If there is even a single “stair step” is not printed, there may be clogging, and it results in banding. You can click the clean button in the software, or press and hold the clean button on your printer for three seconds to begin the cleaning process. After the printer has finished the cleaning process, run the nozzle check once again. Check the results and verify that all the lines in the pattern are printed cleanly. If there are no missing lines, your printer is free from nozzle clogging. Run a test print and verify that the banding issue has been resolved. If even after several cleanings, you are not able to fix the issue, you can use a power cleaning option. To know how to power clean your printer, refer to the user manual. If power cleaning cannot resolve the issue, contact Epson technical support to get a print head replacement. Reducing the quality of printing can also be a cause for the banding. The lines can occur on printouts, and they run on the whole printout. Your efforts of saving ink can make your printer to print with banding lines. If you are not satisfied or you want that your printer should work for a longer time, do not select lower quality settings for printing. The most appropriate solution to this issue is to use high print quality settings. The best print setting to avoid any banding is 1440 dpi. When you use a very thick or very thin quality of paper without changing the paper quality settings, banding can be seen in the prints. This type of banding leads to a print quality similar to the banding due to the misaligned print head. You can get darker horizontal lines throughout the print. When you select the correct paper types, you will not get the banding. To resolve this banding issue, you need to select an appropriate type of paper. Select the paper quality as per the paper you want to use for printing. If you cannot find the paper type you are using, select a type that is similar to the one you are using. If you are still facing the issue and not able to resolve the banding issue in your printer, even after considering all the above options, and you are completely sure that all the things are working correctly, you need to contact the Epson technical support to get the solution to your problem. How to Setup Roku Device on Your TV?